How can I possibly describe these magical islands to someone who hasn’t been there? I thought mainland Portugal (referred to as ‘continent’, by Açoreans) was confusing, with the diverse mix of vegetation, climates, and foods which range vastly from region to region. Landing on São Miguel, the Açores largest island, just added to my confusion and amazement. The Açores (or “Azores” in North America) is made up of 9 islands, with the city of Ponta Delgada, on São Miguel being the capital. These islands are smack dab in the middle of the Atlantic Ocean, probably a big part of what’s lead many enthusiasts to say this is one of the possible locations of the fabled lost Atlantis civilization. About 900 km off of Portugal’s west coast, these islands have created a climate, ecosystem and culture unique to themselves. Let’s get it straight right from beginning…. Being Açorean is not the same as being Portuguese. It’s just not. It’s really hard to explain, and I didn’t really believe it myself. I thought they were just being difficult… kind of like how most Canadians see Quebec.I thought it was a stupid self-separation, but now after being to both places myself, I can confidently say that The Açores is not Portugal. The land isn’t the same, the people aren’t the same, the food isn’t the same. Sure, there are similarities. The Açores were colonized by the Portuguese, so the base language and culture is from Portugal, but to say that The Açores IS Portugal is pretty much the same as saying Brazil is Portugal. It’s not. Portugal was absolutely amazing. Being in Lisbon and experiencing the culture, the history, the food, the diversity…. it was really mind-blowing and eye-opening. After that, part of me thought flying to São Miguel would just be going out to ‘the country’, part of me thought it would be a little boring (don’t tell my wife!). How wrong I was. I’ve spent a lot of time around the Caribbean islands, so I’m used to island life, island landscape and climates, and so I thought I pretty much already knew what the Açores would be like. Wrong again. I was wrong a lot on this trip. Take the large ferns and grand evergreens of B.C., the coastal fishing towns of Scandinavia and the south of France (yes, I know they are very different), the fruit trees and vegetables of the Caribbean and South America, and the green mountains, volcanoes, and cliffs of Hawaii. Throw it all in a pot, mix it up, let it marinate, and then plate it out in the middle of the Atlantic. That’s The Açores. This is the only place where trekked up a volcanic mountain, hiked down into the caldera, which looks like a scene from Jurassic Park, or one of those Disney animations where the animals find their “Utopia”, and seen large pine trees right next to banana trees. I think they pretty much could’ve filmed Avatar there. So… after an hour of trying to explain what The Açores is… let’s get on with the trip. Since our plans were changed, we arrive pretty late in the evening, met the family (Susete’s oldest sister and her family), got our rental car (yes, you should have one on this island), got some food and headed ‘home’. Sãozinha, my sister-in-law and her family live in the same house that Susete all her siblings were born and grew up in. So, for Susete, it really was heading home. They live in the town of Lomba da Fazenda, in the region of Nordeste, on the north-eastern part of the island. The first thing I noticed about the island is the sweeping views, the gorgeous landscape, and the fact that absolutely NO land is wasted. There are vacas (cows) in any free space. Açorean cows are badass cows. They are mountain cows. They can live and walk around the steep slopes on the side of the mountain, and then trek to another patch of land for grazing and live in the flat areas (there are actually very few flat areas there). The cow should be the symbol of the Açores. 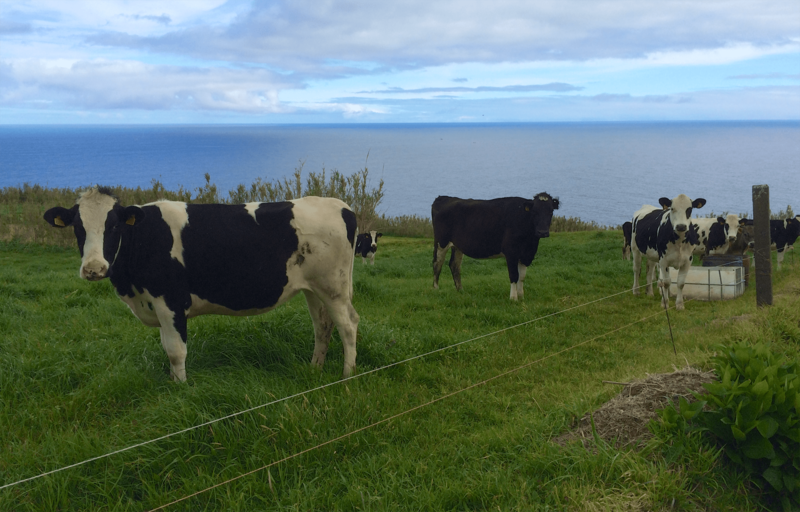 Or at least, São Miguel, as I’m told it’s really only on this island, and São Jorge, the next biggest island, where cows are so prominent. The other islands are too small. In the morning, we woke up and went for a walk around the town. Susete wanted to show me her home. It’s a really sleepy town, as I learned many towns are on the island. It seems that a lot of the young people move to either Ponta Delgada, the continent, or North America for better opportunities, the old people start to pass on, and half the homes are owned by expats living in North America. This means all those homes are empty for much of the year, which makes it seem like a lot of places are half ghost towns. I can understand why many young people move away, because there really isn’t a lot of opportunity, financially on the island, but the beauty is just astounding, so I imagine it would also be very hard to leave there. I know I’d definitely be torn. We saw the houses where both Susete’s mom and her dad grew up in… we met the neighbours, we met some other family, aunts, uncles, cousins. I think she is related to most of the town in one way or another. It’s a really beautiful place. Did I say that already? I’m sure I’ll say it a hundred times more throughout this post. You just can’t escape it. Every direction you look is a sweeping, magical view. The awe-inspiring mountains on one side, and the ocean on the other. Over the next days on São Miguel, we spent a lot of time with family, touring the island, seeing all the highlights of what the island has to offer. These people don’t make a lot of money relative to what we do in North America, yet they still went out of their way to take time off work, and spend their hard-earned money on gas and food, eager to show us the magic that is São Miguel. Susete’s sister joined us for a day traveling to the middle of the island to visit Caldeira Velha, a thermal hot spring and waterfall area halfway up the mountain, which we continued on to the top to witness Lagoa do Fogo (Fire Lake), one of the great volcanic crater lakes on the island. Another day, we took off with Susete’s nephews, Fabio and Ruben, to the central region at Furnas, where it’s well known for more thermal springs, and the town is bubbling. It’s like walking in the middle of an active volcano (ok, I know that’s an exaggeration, but the ground was hot and bubbling). Furnas is famous for cozido, a stew of sorts…. cabbage, taro, potato, yam, chouriço sausage, pork, all thrown into a pot and then lowered into holes dug into the hot ground, and left 6 hours to cook for volcanic steam. It’s a smelly place, but really not half as bad as I’ve heard from other people. I thought the sulfurous smell would 10 times worse, but it was pretty mild to me. From Furnas, we headed to Provoação, the south-eastern region of the island. We found out about a waterfall close to the town of Faial de Terra, and thought it would be nice to visit that. Boy, did we ever underestimate what it would take to get there! We were in touring mode (and gear), not hiking mode. We passed through Faial de Terra (again, a town that seemed like it was pretty much devoid of people), parked our cars up the hill on top of the town, and began walking. From there, things got crazy. Up, up, up, and up some more. Steep mountain slopes, trekking up there, getting the equivalent of a week’s leg workout! Half way up the mountain, we reached the town of Sanguinho. This small town (I wouldn’t even call it a town, but a collection of houses) is a preserved community, for those who want to live the simple mountain life like back in the old days. Apparently, this community was built a few hundred years ago, when pirates started landing on the island, and the people from Faial de Terra (which is on the coast) had to head to the hills to escape. They built stone houses way up in the mountains, which was extremely difficult to reach, and not worth invading, I guess. All I could think about was how the hell did anyone possibly get a sofa up there to their house???? After passing trekking uphill for about 40 minutes, we reached a fork in the trail… you could take one way back down around the other side of the mountain back into town… or keep going another 1km to the waterfall. We came this far, and were tired and not wearing the right shoes, but we weren’t about to waste all that effort! Off we go in search of Salto do Prego (the waterfall)! After trekking up and down steep and narrow mountain trails, about 1hr and 4km in total, we finally found it! What a spectacular site it was. A beautiful waterfall with a pool under it, way high up in the mountain. It was worth it. It was magic. The boys had to get back home to feed the cows on the farm, so we headed home back to Nordeste, stopping at a couple of mirodouros (viewpoints) along the way to see more of the beauty of the island. On our second last day, Susete’s cousin, Paula, and her husband and little son, Fernando and Martim, came with us to show us around the western part of the island. We headed to probably the most famous spot in the Açores, Sete Cidades. This is actually one large crater lake that is somehow separated into what looks like two different ones.. Lagoa Azul and Lagoa Verde, because of their blue and green colours. As expected, this view was absolutely spectacular, and I can see why it’s the most photographed part of the island chain. It’s the one you see in any tourism ad. It’s the main draw, the star of the show. During our trip to São Miguel, we ate most of our meals at home, which was great for me, because I got to experience real Açorean life, rather than just the tourist life. I got to visit all the people that lived there, speak with them (as much as I could with my lack of Portuguese, and their lack of English). I got to see the farm life that ran all over the island. The quintas that existed in pretty much every person’s back yard. Food that’s grown naturally, in some of the most difficult terrain, in small spaces, on the sides of hills and mountains, through riverbeds and volcanic grounds. The Açores is a natural wonderland. It’s a magical place, and one of the most beautiful and unexpected places I’ve ever visited. It wasn’t really until the night before we were leaving, when we all sat down to eat Good Friday dinner, that something really hit me. A realization of what was happening, and where I was. This whole time, we were visiting a magnificent place, as we have visited places before. We were touring around, discovering a new country, and for me, a new culture, new food and experiences. But, it suddenly came to me… the realization that it wasn’t just that. This time it was different. All these people that we have visited, that have shown us so much love. They weren’t just my friends’ relatives, as I have met and visited before. They weren’t just the locals that have been hospitable to us on our travels. This wasn’t just my wife’s family… someone else’s family. This was now my family too. Jorge, Sãozinha, Fabio, Ruben, Paula, Fernando, the cats, the goats, the cows, the quails, and all the other people I met in town there…. All these people were my family. They have accepted and included me as one of their own. Leaving a wonderful place after a great experience is always sad, but leaving family was much harder, and it didn’t quite register with me until then, that I was leaving family. I’ve visited many great places over my lifetime, and will visit many more (hopefully! ), but Portugal will forever hold a special place in my heart, and I will definitely be back there very soon, to explore more, and really get a deep understanding of all things culinary. São Miguel, on the other hand will not just be a place I have visited and will visit again. I wasn’t born there, and didn’t grow up there, and now have only been there once, but every time I go there in the future, I won’t just be going to the Açores… I will be going ‘home’. Lisbon is underrated, and I hope it stays that way! Aaron youre blog has really touched the heart. You are family yes you are. And writing about your experience tells us much more about you that we did not know. Thanks for being you. My sister is a lucky girl and I wish you many more wonderful adventures together.